The saga of a Nevada rancher’s long-running battle over the use of public lands ended exactly how it began — a family angered by the arrest of a son, fueled by rage at the federal government, and eager for the national spotlight. It started on April 12, 2014, when Cliven Bundy and his family led a group including hundreds of armed far-right militants at his Bunkerville ranch in defying a federal government effort to seize his cattle because of more than $1 million in accumulated grazing fees and fines. The Bureau of Land Management (BLM) and the Las Vegas Metropolitan Police Department opted to leave Bundy’s ranch that day when the rancher’s followers appeared ready to open fire on them. And it finally ended for the Bundy family on Feb. 10 of this year, when Cliven Bundy was arrested just days after his two grown sons were also handcuffed at a roadblock in Harney County, Ore., where Ammon and Ryan Bundy led a similar armed standoff at the Malheur National Wildlife Refuge. The elder Bundy was on his way to help keep alive the occupation, meant to showcase opposition to federal land use policies, but the last four occupiers surrendered a day after his arrest. The entire odyssey had lasted 670 days. In between, the Bundys and their followers seemed to most observers to be getting away with outrageous and criminal conduct. Many at the first standoff had pointed their heavy weapons directly at law enforcement officials, a serious felony, and those at the second trashed the Malheur refuge to the tune of $4 million to $9 million, according to various estimates. Their apparent imperviousness to arrest dramatically emboldened the antigovernment “Patriot” movement, whose members staged a number of similar but smaller confrontations with the government. But in the end, the authorities acted. Although they had initially allowed the Bundy sons and their followers to travel in and out of the Malheur refuge they’d occupied, on Jan. 26 they set up a roadblock to arrest the occupation’s leaders as they traveled to a public meeting in John Day, Ore. While most of them surrendered, militant Robert “LaVoy” Finicum, who’d vowed not to be taken alive, apparently reached for a loaded gun in his pocket and was shot dead by a state trooper. Two weeks later, the Bundy patriarch was arrested at Portland International Airport. Nineteen people were charged in connection with the 2014 standoff and another 27 for their actions in Oregon this year — a total of 46 people, all facing federal felony charges, in some cases connected to both confrontations. Cliven Bundy had been a radical for many years before the standoff in Bunkerville, Nev., where he had a 160-acre ranch but used thousands of acres of adjoining federal land to graze his cattle. In 1992, after years of paying federal grazing fees — at a price of less than one-sixth the market rate — Bundy decided to stop paying, saying he no longer recognized the authority of the BLM. The battle that followed was in and out of the courts for decades. In 1998, Bundy was ordered by a federal judge to remove his cattle from the so-called Bunkerville Allotment but refused to do so. Another, similar order followed in 1999. In 2012, a planned roundup of Bundy’s cattle was called off because of his threats of violence and because the local sheriff, Doug Gillespie, refused to help without a renewed court seizure order. The government filed yet another case in response, and in 2013 a new federal ruling permanently enjoined Bundy from using the land. But Bundy, who’d been there since 1948, still refused to leave. At the same time, over the years, Bundy made his radical views known in both court documents and a variety of statements. He said the federal government had no jurisdiction over public lands, although a series of court decisions in the 1980s showed he was completely wrong. He described Nevada as a “sovereign state” and said he was a citizen only of that state. 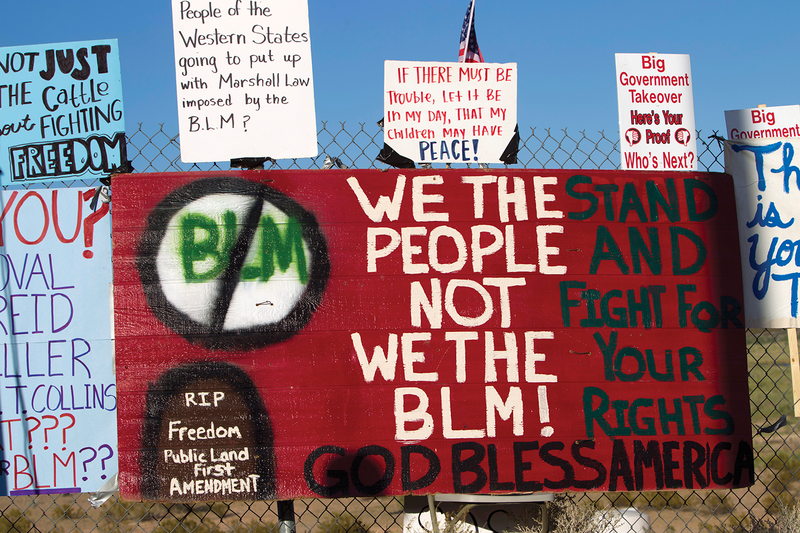 He refused to recognize the BLM’s authority over public lands, an increasingly important claim among Patriots. And Bundy used the language of the “sovereign citizen” movement, made up of people who believe they are immune to most laws. He also lauded the ideas of the “county supremacy” movement, a radical ideology that describes local sheriffs as the highest legitimate law enforcement authority and that was concocted by the violently racist and anti-Semitic Posse Comitatus, a group active in the 1970s and 1980s. And, facing the prospect of a bloody shootout, they did. What was perhaps most remarkable about the whole story was the support that Bundy, a scofflaw who was essentially stealing from the American people, received from politicians. Sen. Dean Heller (R-Nev.) called the Bundy gang “patriots.” Soon-to-be GOP presidential candidate Dr. Ben Carson said they were “pretty upstanding people.” Sen. Rand Paul (R-Ky.) claimed they had raised a “legitimate constitutional question.” Sen. Ted Cruz (R-Texas) said the standoff was the “tragic culmination” of President Obama’s attacks on liberty. Donald Trump said he “liked” and “respected” Bundy. Nevada Assemblywoman Michele Fiore (R-Las Vegas), who traveled to the ranch twice during the standoff, attacked the BLM’s “atrocities” in the case. 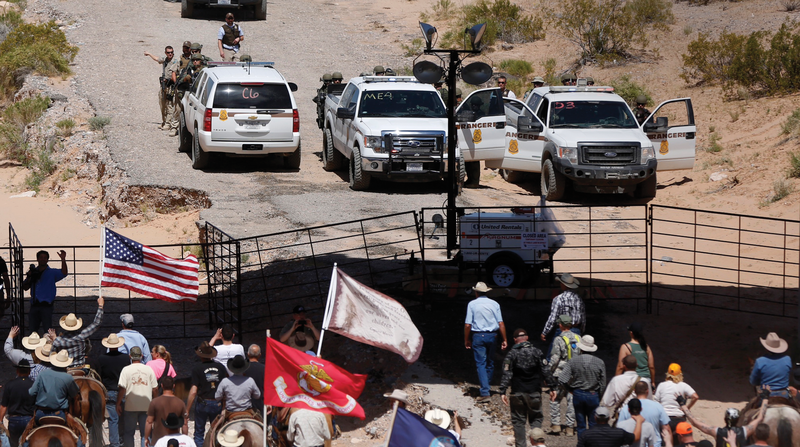 One year after the Battle of Bunkerville, the Bundys gathered with a few dozen supporters at their ranch for a “Liberty Celebration” marking the anniversary of their apparent victory. No had been arrested or charged in the case, despite frequent comments from officials suggesting that they one day would be. Bundy was gleeful as he took to the stage to dance with his daughter and blare his defiance. Even if Bundy’s understanding of the Constitution was fatally flawed, it was true that a line had been drawn. In the year leading up to the celebration at the ranch, protesters led by Ammon Bundy had forced their way into Recapture Canyon, Utah, which the BLM had closed to protect an archaeological site. Other armed militants sought to “defend” miners in disputes with officials in Oregon and Montana. Battles over land, environmental and gun regulations were spreading across the nation. Then, in January of this year, Ammon and Ryan Bundy traveled to Oregon to protest the pending re-imprisonment of two local ranchers, Dwight and Stephen Hammond, on convictions for arson on public lands. The men had initially received very light sentences, but an appeals court said their terms were too short under federal law and ordered them re-sentenced. Remarkably, although the Hammonds met the Bundys, they rejected their offer of help. Instead, the Hammonds urged the Bundys and others to go home and, in a few days, reported to prison as ordered. The Bundys didn’t take that advice. 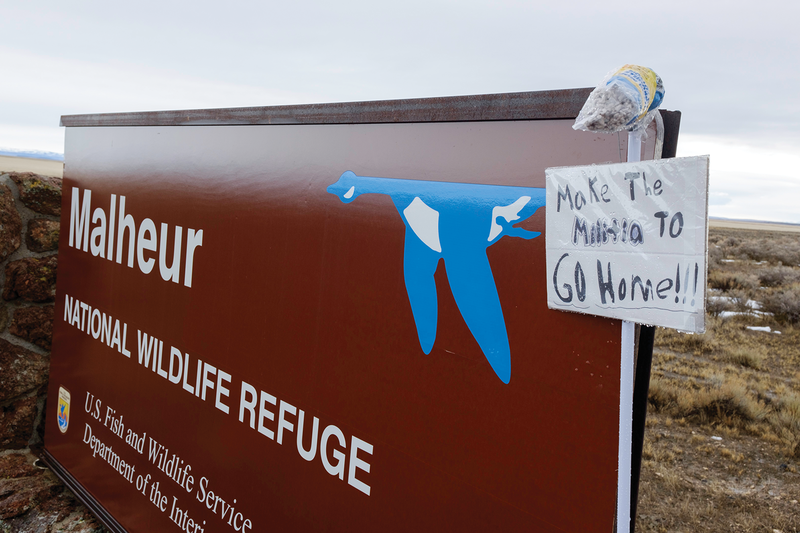 Instead, following a Jan. 2 rally, they led a group of heavily armed, militant supporters to Malheur, said to be one of best birding sites in the United States. Ammon Bundy told a reporter that the occupiers were “planning on staying here for years. Absolutely.” They would not leave, they said, until the Hammonds were freed and Malheur turned over to local control. The militants, in line with their ideas about county supremacy, tried to enlist the support of Harney County Sheriff Dave Ward — to no avail. “These men came to Harney County claiming to be part of militia groups supporting local ranchers,” Ward said. “[I]n reality, these men had alternative motives, to attempt to overthrow the county and federal government in hopes to spark a movement” nationally. The situation went from bad to worse for the occupiers. Ward and other county leaders urged them to leave, with Ward even offering them safe conduct out of the county. Locals grew angry as their towns were overrun by armed outsiders who were being allowed freedom of movement, and government employees were relocated at great expense to avoid confrontations. Editorial boards began calling on law enforcement officials to act. Sheriff’s deputies were recruited from surrounding counties to help Ward and federal authorities police the ongoing standoff. Then officials began to move. A man who stole a pickup truck from Malheur and drove it into town was arrested. Five militants, including the Bundy brothers and Ryan Payne, were arrested at the Jan. 26 roadblock. And Finicum, driving a second vehicle, ran one roadblock, nearly ran over an FBI agent at a second one, fled his vehicle after it ran into a snowbank, and was killed when he tried to draw his gun. A couple of weeks later, Cliven Bundy, enraged at the arrest of his sons and aiming to encourage occupiers to stay at Malheur, decided to go to Oregon. America didn’t seem to wake up, but law enforcement officials certainly did. Cliven Bundy, who was now 74 and unarmed, was arrested as he landed in Portland. The four remaining holdouts at Malheur decided to surrender a day later. There is little question that the 22 months it took for law enforcement to finally arrest the Bundys and their confederates helped the antigovernment movement grow. Now, with officials clearly determined to crack down on the kind of lawlessness the Bundys represented, it’s unclear what the future holds. In the wake of Finicum’s death, as with so many things in the Patriot world, conspiracy theories have proliferated. Thousands of Bundy sympathizers believe that Finicum had his hands up when he was shot, that he never went for or even had a weapon in his pocket — that his killing was simply a government assassination. But an FBI surveillance video seemed to clearly prove that that was not the case. The Intelligence Report counted 82 pro-Finicum, antigovernment rallies in the two months after his death. David Cordea, a member of the Oath Keepers group that supported the Bundys, warned that there was “justifiable speculation” that officials planned a “massive operation” to round up Bundy sympathizers nationally. And in June, a new warning bell went off. That month, the FBI arrested William Keebler, 57, of Stockton, Utah, just a day after undercover agents watched him allegedly push a detonator button on what he believed to be a real bomb. It had been placed against a building at the BLM’s Mount Trumbull complex in Arizona, and the FBI said in court papers that Keebler and Finicum had cased the site in October 2015. The FBI said that an undercover agent who accompanied the two men at the time took photographs. Keebler called himself the “commander” of the Patriots Defense Force (PDF), a pro-Bundy group based in Utah. Court papers say the PDF had links to another militia group in Washington, trained its members in military and survival tactics, and angrily opposed federal government policy on public lands. “Keebler has continued to recruit, organize, and prepare the PDF for the day when they can take part in an antigovernment action with other militia groups,” the document said. If William Keebler’s case is any indication, one thing seems certain: While the Bundy family’s decades-long fight with the federal government may be coming to an end, a movement birthed in large part by them is far from over.